Next to shells, animal bones are one of the oldest materials used for jewelry. 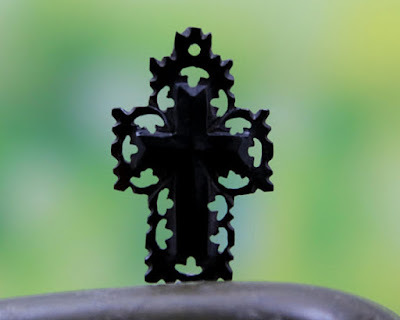 Carving them into adornment is also an ancient craft. 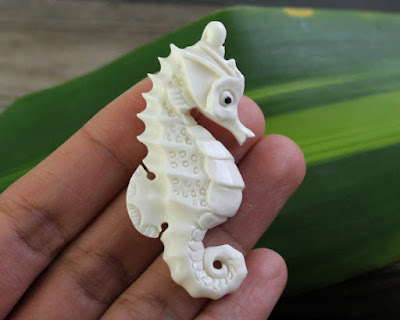 Boneaddict showcases some beautiful handcarved ox bone, bull horn, all of which are sustainable, organic, and ethically-sourced. They also do lapidary but their hand carved pendants are standouts. The majority of these amazing pieces are made by Widya who is based in North Carolina and her family back in Indonesia. From time to time, some of the pieces are sourced from other local carvers to keep up with demand. Many of the pieces are intricately carved. Most are not very big - the eagle above measures just over 2 inches across and is under 1 inch high. Widya says they do welcome requests for drilling holes if the pendants are undrilled. But wire wrappers or bead embroiders don't need that! Some of the designs are much simpler. I rather like the Maori fish hook (Manaia Hei Matau) pendant below. 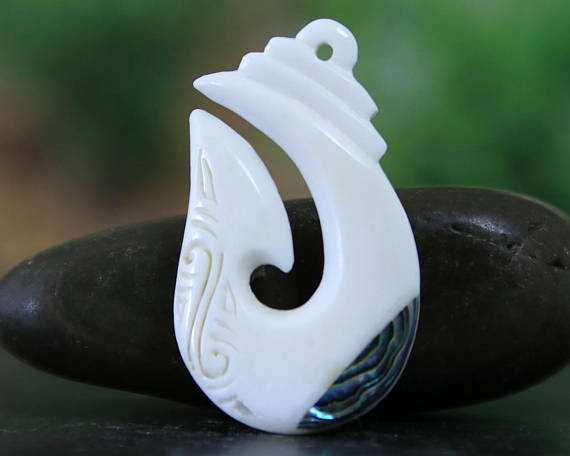 It is a common Maori motif based on the mythological creature, Manaia. Remember the Disney movie, Moana? The fish hook features in it! How did she end up hand carving bone? Widya said, "I grew up in Indonesia—surrounded by wildly beautiful things like turquoise crater lakes, smoking volcanoes and the indescribably brilliant blue of the Bali Straight—all in my own backyard. Both my parents worked for the national park system, so I was blessed even more than most Indonesians to appreciate the variety and drama of my country. In the evenings, I used to watch my dad do lapidary and silversmith work to create the most marvelous pieces." She is doubly inspired - by the natural beauty and by her father. 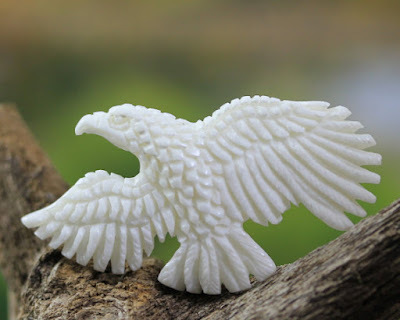 Widya has generously offered all readers a great 25% discount - use this code BEADINGGEM. Checked out their Etsy shop -- absolutely stunning variety. Wow. It was very hard to choose my favorites for this feature, for sure! What beautiful work. 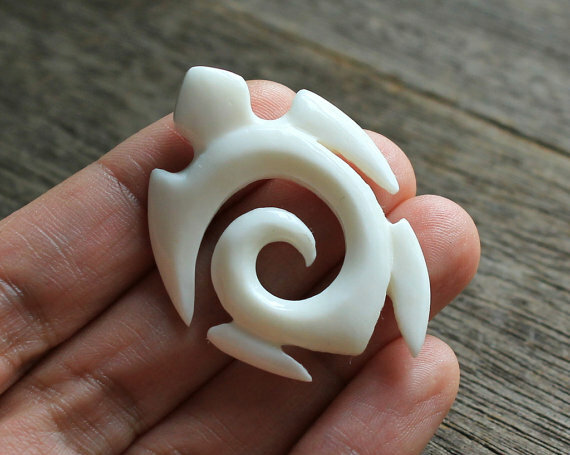 I've been collecting items carved from natural products for years. 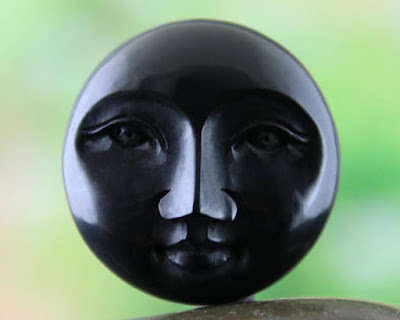 The largest part of my collection consists of Native American fetishes, but I also have carvings from Alaska, the orient and tagua nuts. I'm really enjoy the feel and beauty of natural products. Again these are lovely. Wow! I simply can't imagine the process involved in doing this! From my travels the Maori fish hook and Hawaiian turtle really speak to me. What is it for you Pearl? The first thing that caught my eye was the Maori hook. 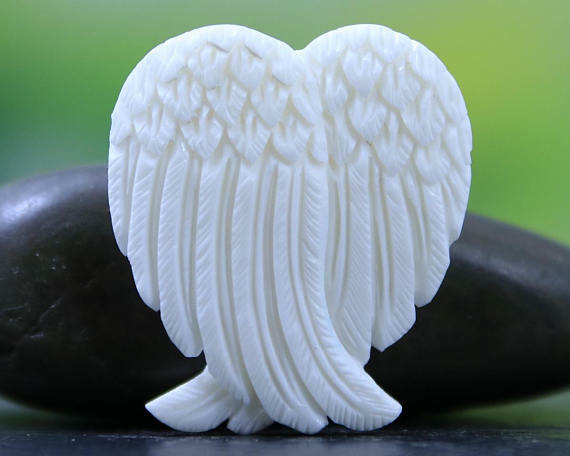 There is something about the flow of that carving which speaks to me!